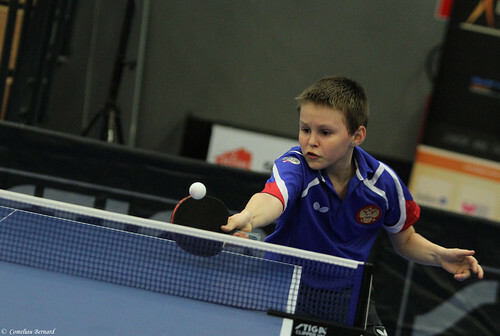 The final day of the 2017 ITTF Belgium Junior and Cadet Open saw the two doubles competitions in the Cadet category draw to a conclusion, and the main theme that both events have in common is that the trophies went to mixed nationality pairings on Sunday 23rd April in Spa. Amy Wang of the USA and Thailand’s Monsawan Saritapirak eventually emerged as champions in the Cadet Girls’ Doubles tournament, but the top seeds came close to missing out on the final as the duo were subject to back-to-back five game thrillers in the quarter-finals and semi-finals. First up for the USA and Thailand combination was a tense fixture against Russia’s Anastasia Beresneva and Karina Iusupova (11-8, 11-7, 9-11, 5-11, 11-9), before a meeting with Hungary’s Veronika Menko and Viola Phan in the last four went right down to the wire (16-14, 11-9, 9-11, 8-11, 14-12) with Amy Wang and Monsawan Saritapirak moving through to the final. Awaiting the mixed nation partnership in the final was Hungary’s Helga Dari and Anita Drabant following a comfortable 3-0 victory against Belgium’s Maelys Dahy and Estelle Duvivier in the quarter-finals (11-8, 11-4, 11-2) and a straight games success over England’s Charlotte Bardsley and India’s Vanshika Bhargava in the last four (11-7, 11-7, 11-6). Despite the final producing a highly entertaining battle between the top two seeded pairings, Amy Wang and Monsawan Saritapirak were rarely troubled in the match and came out on top in four ends (11-3, 14-12, 9-11, 11-8) to lift the title. Day Five’s Cadet Boys’ Doubles action got off to a shocking start as the top seeds Olav Kosolosky and Adrien Rassenfosse were knocked out of the competition at the quarter-finals stage by Finland’s Arttu Pihkala and Noah Steif (7-11, 15-13, 7-11, 11-6, 11-8). Arttu Pihkala and Noah Steif carried their confidence boosting momentum through to the semi-finals where the no.5 seeds edged out another Belgian partnership with Boris Dobbelstein and Mattias Nacer narrowly losing out (9-11, 11-13, 11-8, 11-9, 11-6) putting the Finnish duo into the final. However, the trophy would end up in the hands of Ireland’s Owen Cathcart and Norway’s Borgar Haug who saw off Arttu Pihkala and Noah Steif with a dominant display in the final, claiming the silverware with a straight games triumph (11-7, 11-8, 12-10).